Now you can easily use hi-res human figures in your Cinema 4D work. This plugin allows you to move complete figures from Poser to Cinema 4D. Improved auto-generated weight maps. 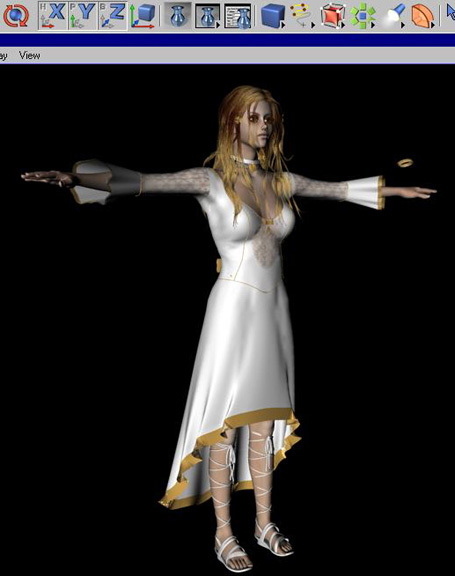 Poser files do not define weight maps, so they have to be created. The 1.1 version creates a better starter set meaning less work in getting the figures ready to animate. Support for the multi-use morphs in Vickie 2 &3 and Mike 2. these new hi-res models contain morphs for body parts that get reused several times as parts of different body level morphs. these are all now assembled correctly. This fixes a problem that esopecially some of our Mike users had been having. Imports all material colors, texture, trans, reflection and bump maps and settings, applying them correctly for Cinema 4D. Parents and positions figures and props. Optional scaling of props and figures. 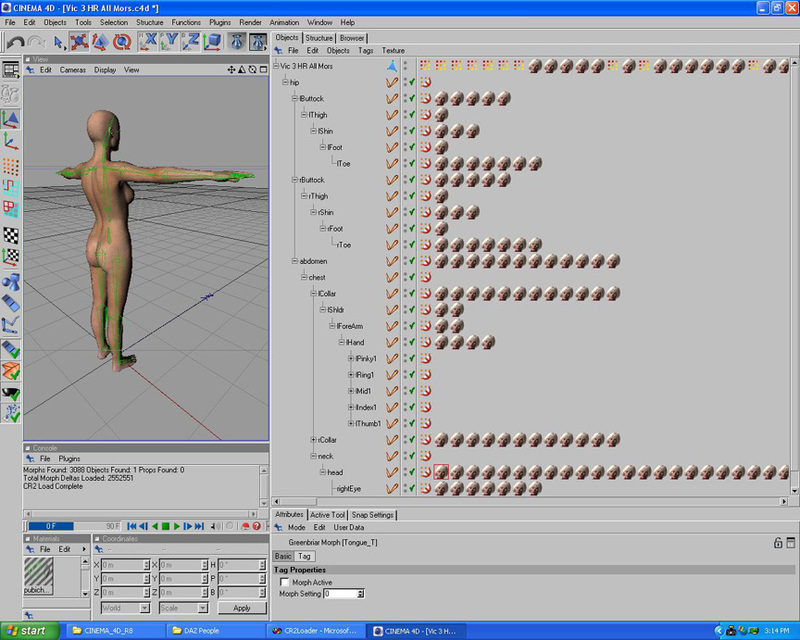 Creates a default weight map for each bone. The default map consists of all points in the corresponding body part set to 1.0 all others 0. Or a set of shaded weight maps. While not complete, these auto generated maps, based on the Poser joint settings, reduce the amout of work needed to complete weight map sets. Since the point sets are the same for all characters based on the same mesh, these sets can be tweaked, saved and then re-used for different characters. A much better auto weight map creation set is under construction and will be a free upgrade to both the C4D and LW versions of CR2 Loader. Has a create character function. This allows you to 'spin the dials' in Poser and create a new character and when you import it into C4D, all the creation morphs will be applied to the base mesh instead of being loaded as morphs. This helps reduce the number of morphs to a C4D manageable level. It functions by applying, at the dial setting, any non-zero morphs and loading all morphs set to zero to use for animation. You can also flag morphs that are just to be dropped and not imported. A more efficient way to create characters in Poser for C4D! Now also uses Body level Poser dial settings as well as part level settings when merging character morphs. Created a completed weight map set. Joints still have to be edited (but hopefully not for much longer). The plugin does create a weight map set, so the characters are animatable as is, but the joints need to be smoother. Read Poser pose type files. Note - pz3 / pzz support is currently the same as cr2 / crz - figures and props, we are not currently importing the animation data from the pz3 / pzz files. I have only come across two issues: location of texture files and morph capability. C4D does not like it if you have texture maps that are not in the same directory as your scene file and it positively hates it if they are in multiple directories. I strongly suggest that you move the .cr2 (or other) file that you are going to load, along with all the texture maps it needs to a working directory and then run CR2 Loader and then save the .c4d file to the same directory. This works without a hitch. Every time I've had problems with textures, this fixed it. The CR2 Loader supports three morph formats - morphs as a full polygon object as a child of the main object, as a point only object (both of these formats are useable by the Mocca morphixer) and as a Greenbriar Compressed morph. We decided that we would have to add a better morph system to C4D to be able to handle Poser figures, especially the DAZ figures. There are two problems with the Mocca morph method. The first is that by adding 125 morphs, it now takes 20 seconds to get an image back after moving a bone (this is the same with full or point only polygons). All those objects have to be dealt with and it brings the GUI to a halt (425 morphs, a typical fairy count, and it hardly moves). The other problem is space. Our current worst case Vic 3. She has 3,088 morphs in the complete model. 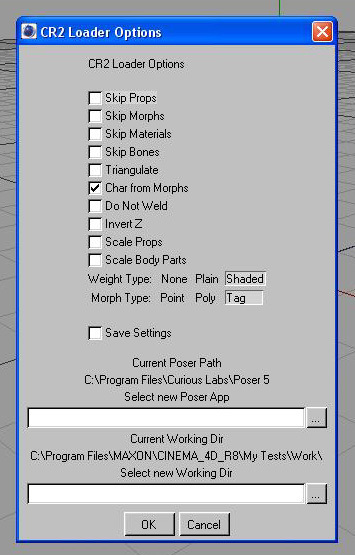 To create a a polygon based morphset I need 6.2G to load the morphs alone (each 74.5K mesh is 2M). With points only it's 2.8 G. My 1.5 G machine simply crashes. So CR2 loader is already set up to write to our new compressed format. I only store points that are different from the base mesh. With it I can easily load the entire Vic 3 model, with all morphs added. The 2,552,551 points that are actually different in the morphs take up 40.8M. And since they are not seen as geometry by the GUI they have NO effect on it's performance. I can animate away. All the preceding gobblety-gook is to explain why we have created a new morph package and why it has taken so long to get even the CR2 Loader complete, for without the morph system, the models will not be useable. The morph object itself is finished and the new morphmixer is under construction. Our C4D GMI product will also be getting a free upgrade to allow it to use the new morph system, as well. Now Available - See our C4D Morph System page! CR2 Loader Available now for Mac and PC! Vic 3 with all morphs as loaded by our plugin. The little Vic 3 heads are the compressed mophs saved at the body part level (so they don't ALL appear on one line). On the top row are the morphs that were found on more than one body part and were converted to body level morphs. Fairy alexis with default costume and colors.Unretouched. The shirt needs to move down a bit. I'm leaving the problems on these figures, so you'll have a better idea of how they load. Everyone creates their models files differently. Alexis Skin texture closeup. Untouched model and render. Cayenne by Thorne. Notice good alignment of the five props. The anime eye morph needs to be turned down a little. This is due to the differences in how Poser and C4D scale body parts, so the head is slightly smaller so the eyes protrude a little (this model has the same issue in LW). Vic 3 standard with hi-res maps. Ziza by Thorne. Body part scaling was used, and the figure becomes a little too small. Scaling works VERY different in C4D and Poser. I will adjust her back up a little by scaling the hip bone.